We are well aware of how spies were used by the British government to ensure America's entry into World War II, as well as to rid the White House administration of leftist Vice President Henry A. Wallace (see J. Conant's The Irregulars for details on that operation). But did the spying operations continue beyond that point and into the 1960's? We have been told that Sir William Stephenson had sold Hillowton, his residence in Jamaica, in 1951 and relocated to Bermuda. His closest neighbors while he was there would have been the men who developed the resort of Round Hill and later Tryall. We will first determine who those Anglo-Jamaicans were by returning to the 1957 article, which announced the plan to construct the Tryall Club. 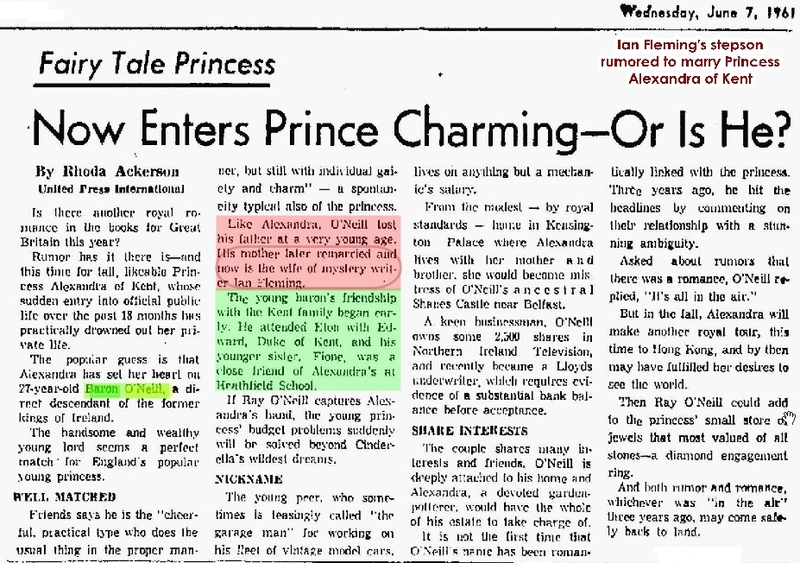 We again post the news clip for ease of reference as more unfamiliar names are brought forth. Simply click on the article to the left to see the full size version. British colonialists comprised the Jamaican delegation of the syndicate of investors. Jamaica had begun as a base for privateers and English capitalists using black slave labor to operate sugar plantations until abolition of the slave trade in 1834. The island, previously a part of the Dominion, became a member of the British Commonwealth in 1962; the old colonial mansions, called Great Houses, remained until the descendants of the families got together and decided to develop possibilities for tourism. One leader of the 1957 Tryall syndicate was George Breary Girardet, who, during WWII had been personal pilot to Lord Louis Mountbatten, Supreme Allied Commander in the Far East--although officially Girardet was a squadron leader with the Royal Air Force Bomber Command. Not only was Girardet's boss, Lord Mountbatten, the uncle of England's Prince Philip, the Duke of Edinburgh--whose wife was crowned Queen Elizabeth II in 1953--but he had a few eery contacts to several of the British friends of Clay Shaw, the only man brought to trial for the assassination of President John Kennedy. adopted a son, Charles David Duff (b. 1950), who became a theatre historian. A documentary screened on BBC Two Wales in 2005 ("Faenol: Secrets Behind the Wall") featured Charles Duff discussing his childhood, the bisexuality of his adoptive parents, their marriage of convenience, and the details of his parentage. 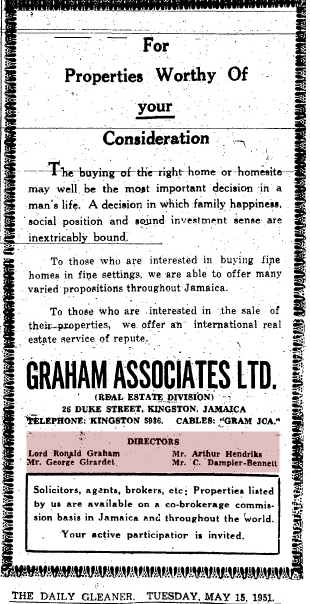 Lord Ronald Graham, Realtor, P.O, Box 16, Ocho Rios, Jamaica was interviewed regarding the lease of a house and hiring of servants for a period from July 12, 1969, to November 1, 1969. The lease was signed by Ravenel Stanland and Charles Tacot. The terms of the lease was a rent of $3,000 payable by a 25 percent deposit with balance on arrival. 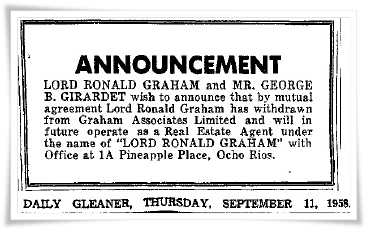 A cook, maid and gardener were to be supplied by Mr. Graham's real estate office. Sometime following the Tate murder, August 8-9, 1969, the dates of the lease were changed. The departure date was changed from November 1, 1969, to August 23 , 1969. The last person to occupy the residence left August 18, 1969. Investigating officers then traveled to Montego Bay, Jamaica where it was learned that Daniel Stanland had leased a car from Avis-rent-a-car. John, born in 1925, was the son of Kenneth and Carmen DeLisser Pringle. They operated the 100,000 acres of sugar, banana, citrus and cattle lands throughout the Parishes of St. Ann’s, St. Mary’s and Portland, assembled in the early 19th century by Sir John Pringle, and by 1953 John had inherited the land and set up the Round Hill Hotel. He was given the title Custos of Hanover. 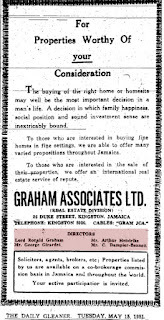 John's mother was a member of the DeLisser family, which included William DeLisser, whose wife -- the former Ida Browne (daughter of a famed member of Prince Philip's polo team, Charlie Browne) -- owned the Tryall Estates since the end of WWI. Estimated cost of the road, planned for a proposed resort area, is £300,000. This announcement followed an informal meeting between Mr. Coombs and Messrs. George Girardet of Rose Hall Limited, and Claude N. Clarke, surveyor, at the Ministry, last Wednesday....The project for development of the Rose Hall area is being financed by local, English, United States and Canadian investors. The directors of the development project include the Hon. 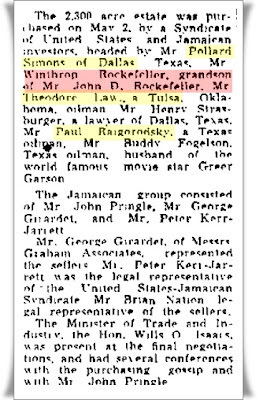 F. M. Kerr-Jarrett, Gustos of St. James, Chairman; and Mr. S. Bronfman, President of Seagrams, Mr. John Loeb, Senior Partner of Loeb and Rhodes, Bankers of New York, Sir Gordon Munro, retired London banker, Mr. John Pringle of Round Hill, Mr. Peter-Jarrett of Montego Bay, Lt. Col. William Noble, and Mr. George B. Girardet of Graham Associates Ltd. Mr. Girardet declared that all the finance required is available immediately, according to the release. The development area will make adequate provision for public bathing, fishing and picnicking facilities. Included in the plans are three seaside parks and three road-side parks. Alex Goldberg, chairman of the Board of Directors of Captain Morgan Rum Distillers (Jamaica), Ltd., Mr. Adalbert Herman, Director of Production of the Seagram organisation in Canada; and Mr. A.M. Henderson, Secretary-Treasurer of the Distillers Corporation— Seagrams Ltd., the parent company. Mr. V.C. McCormack, director and Resident Manager of the company in Jamaica, was at the airport to meet the party, who plan to remain here for two to three weeks. 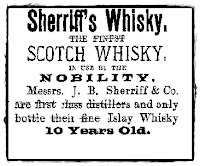 In 1953 Messrs. Seagram Ltd. of Montreal, Canada, a wholly-owned subsidiary of distillers corporation came and bought out all these Long Pond estate holdings from Sherriff and Co. The president of the overall operations was Mr. Samuel Bronfman who had formed a tripartite organization consisting of Canada, U.S.A. and the world. This company is regarded as a world leader in rum production, while also being the largest distillers. It is in this regard that the famous Long Pond rums have long been used as part-blends in these operations to help in achieving the place of the largest supplier of high quality rums in the world. These Trelawny estates are administered by Mr. Charles R. Bronfman as President of the House of Seagrams Ltd. representing his father, based in Canada. They both have shown great interest in the advancement and growth of Jamaica in world economy and especially so with Long Pond in Trelawny. Sir Edward Stubbs Hopes For Improvements in Water and Road Facilities of Island but Careful to Remind Large Gathering That he Commits Government or Himself to Nothing. 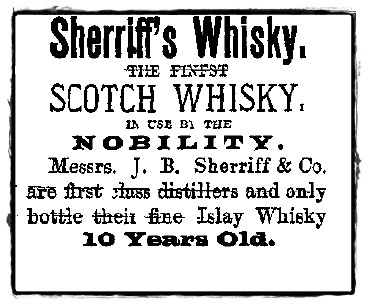 In 1921 Messrs. Sheriff and Co., well known Distillers from Scotland, purchased Long Pond. In 1953 Seagrams Limited of Montreal, Canada, a wholly owned subsidiary of Distillers Corporation, purchased the Long Pond Estates. The year 1955 ushered in a new era for the owners of Long Pond who acquired Vale Royal, a neighbouring Estate owned by the late Mr. Arnold E. Muschett. It would appear to anyone who knows the role the Bronfman family has played in the distribution of bootleg whisky and the creation of the same routes for distributing illegal drugs that Jamaica had become an integral part of their scheme by the time Tryall was planned. We will pick up with the Americans involved in the Tryall syndicate next time. 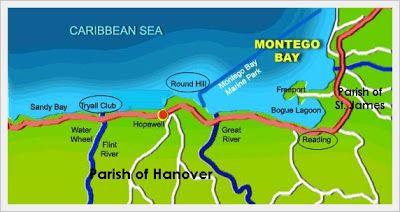 In our last entry at this blog, we posted a news article about Paul Raigorodsky's co-investors in the development of the Tryall golf club in 1957, a 2,300 acre resort development 12 miles west of Montego Bay, Jamaica, often incorrectly said to have included within its acreage the former residence of Britain's North American chief of Intelligence, Sir William Stephenson. The top British spy's Hillowton home had instead been, it appears, a few miles to the east of Tryall and Round Hill--in Reading, St. James Parish, all as shown on the map below. In 1940 the Intrepid BSC head was placed by Prime Minister Winston Churchill in an office in New York -- Room 3603 of Rockefeller Center -- and by war's end his position at BSC (British Security Coordination) had become an umbrella spy society covering MI5, MI6, the Secret Intelligence Service (SIS), Special Operations Executive (SOE), and the Political Warfare Executive (PWE), in all of North and South America as well as the Caribbean. Spying against American Presidents and their officials (as revealed in books by authors Jennet Conant, Thomas E. Mahl and Donald Sturrock) did not end after the war. The propaganda machine had been placed in high gear and continued at a seemingly relaxed pace in the British islands south of the United States, where the British spies partied with Americans, both their witting and unwitting tools. Stephenson's death occurred on January 31, 1989, in Bermuda, where Stephenson moved after allegedly selling his Jamaican home, Hillowton in 1951. By 1989 spymaster Ian Fleming had already been dead 25 years, his death occurring only a year after the assassination of President John F. Kennedy, ironically a fan of the James Bond novels. Six years before that infamous murder, members of the Dallas community where Kennedy's brains were splattered over Dealy Plaza were making plans to construct the Tryall Club adjacent to Round Hill, in Montego Bay. Popular with British aristocrats and their American counterparts, Round Hill has been called "the first great post-war hotel, a meeting place for New York socialites and European royalty, a private retreat for Hollywood on holiday." vivacious Pat Harmsworth of London, wife of the heir to the title Viscount Rothermere [her husband's father was Esmond Cecil Harmsworth]. "After lunch, there's swimming, water skiing, snorkeling, but mostly tanning. "You have to get a tan. People don't know where you've been otherwise." Pat and her husband live in a cliffside home at Round Hill that Pat bought by accident. "I bid on it just for fun, and suddenly, I had a winter cottage." 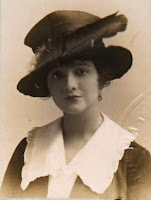 Pat's husband was stepson to Ian Fleming's longtime mistress (later wife), Ann/Anne Charteris Harmsworth, who had vacationed in Jamaica with Fleming for years while married to Lord Rothermere. Her first husband, the 3rd Baron O'Neill died in 1944, and though having had affairs with both Harmsworth and Fleming while married to him, she married the wealthy Viscount Rothermere in 1945; they divorced in 1952 after she became pregnant with Fleming's son. 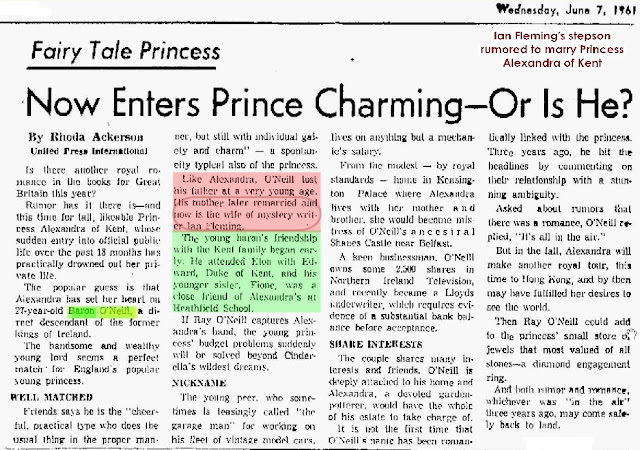 A son from her marriage to Baron O'Neill would be widely rumored to be the man who would marry Alexandra of Kent, though the Princess would actually choose Angus Ogilvy in 1963. Texan Conspirators against Liberal Presidents? The Murchisons [John D. and Clint, Jr.?] owe several millions to Mrs. Robert Young, widow of the late New York Central executive, and, according to SEC records, have borrowed $3,000,000 from Arnold S. Kirkeby, who owns the Kirkeby hotel chain and who once borrowed indirectly from "Longy" Zwillman, the New Jersey gangster, to acquire the Sherry-Netherland in New York. It's a frantic battle between the new Texas oil millionaires and the old Scotch Wall Street millionaire. Whoever wins out on May 1 will control two major railroads and the biggest mutual funds empire in the world. The battle will be worth watching. 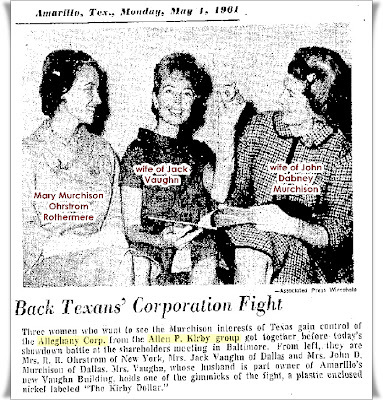 When Bubbles' father-in-law married a third time, his new wife was former Texan, Mary Murchison Ohrstrom, the woman pictured above. 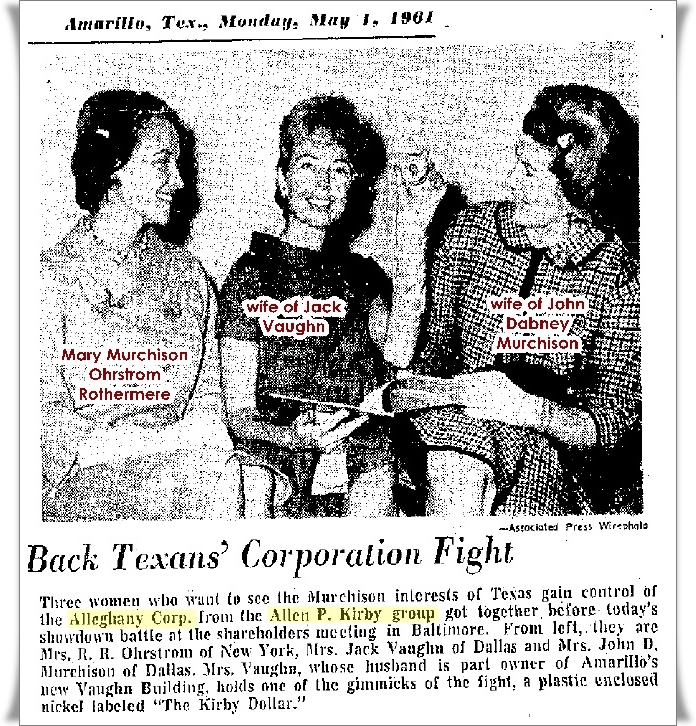 She was a daughter of Kenneth Murchison, whose older brother of Clinton Williams Murchison, Sr. of Dallas, was the father of the proxy battlers against Allan P. Kirby for control of Alleghany. Clint Sr. and Kenneth were sons of a small-town banker, and grew up in a family with ten children. 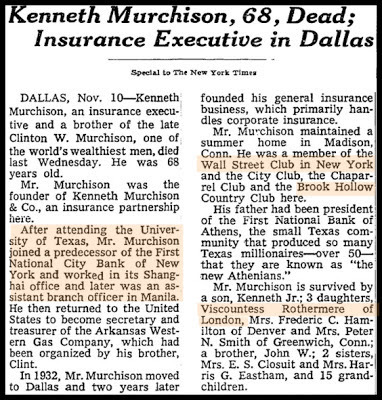 Kenneth graduated from the University of Texas and went to work for a prominent Wall Street Bank at 60 Wall Street. At age 23, Kenneth applied for a passport, to go to the Philippines and Hong Kong on business. 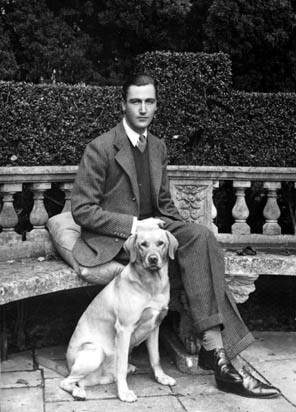 Daughter Mary married Ian Fleming's wife's stepson. He married Helen Claire Delaney, daughter of oil producer Michael Joseph Delaney of Bowling Green, Ohio in 1929, and they set up housekeeping in Highland Park, north of Dallas, where he worked for his brother Clint. 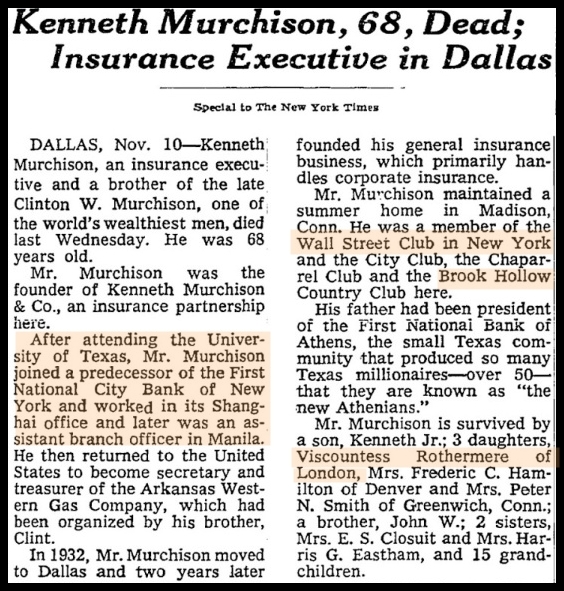 Years later they lived at 3525 Turtle Creek Blvd., and Kenneth ran the Insurers Corporation in Dallas. Growing up in an assortment of states, Helen Delaney Murchison had moved from Ohio to South Boulder Avenue West in Tulsa, Oklahoma by 1910, and lived a couple doors away from oilman, Charles John Wrightsman, and his son Charles B. Wrightsman who was four years older than Helen. We will return later to Charles Bierer Wrightsman and the other "conspirators." In the meantime, do your own research, and feel free to comment below. you what motivated him; was it purely a social matter? my wife to meet them at Oswald’s house. Max Clark, an attorney and former industrial security supervisor at General Dynamics, was a mentor for de Mohrenschildt and this community. Clark was part of a network of security personnel that put the squeeze on the Kennedy Administration that year to get General Dynamics' TFX project in Fort Worth approved over their Boeing competitors At the time, this deal to churn out the F-111 fighters was one of the largest military contracts in history. The White Russian community harbored an underground anti-Soviet movement known as the NTS. The Dallas White Russian community was tightly aligned with an anti-Soviet movement known by its Russian initials of "NTS" (National Alliance of Russian Solidarists). 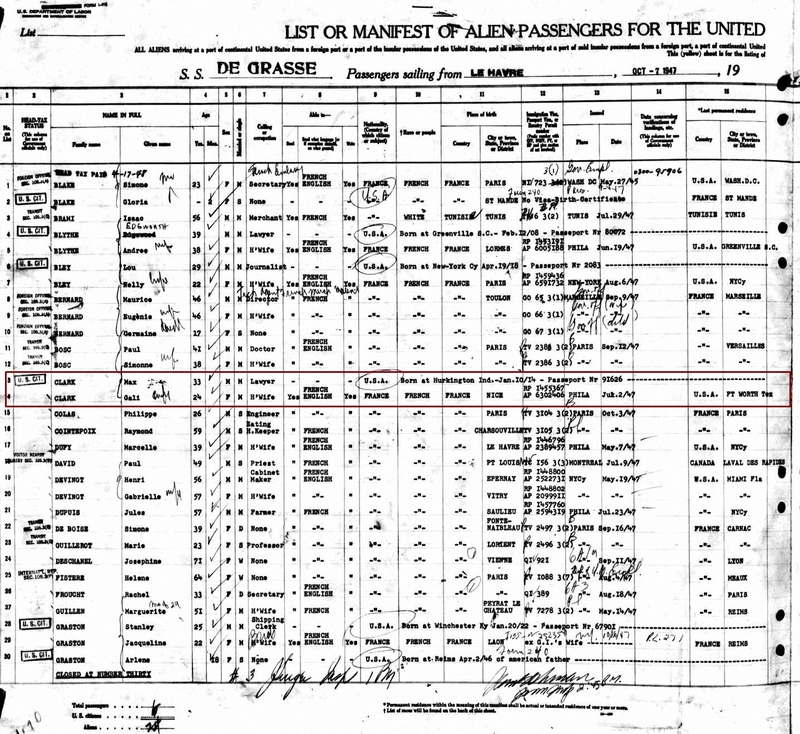 Documents show Max and Gali had married at some point before 1947, when as a couple, they returned from France aboard the S.S. De Grasse. The address shown for Max and Gali Clark at that time in 1947 was 608 Eighth Avenue in Fort Worth, Texas--a four-unit apartment house quite close to the historic Thistle Hill mansion built for Electra Waggoner Wharton. This apartment was only two streets over from the Sixth Avenue office building--where Max Clark's father's oil business had been housed for many years. The building was named for the late Dan Waggoner and his widow and built by rancher/oilman, W. T. Waggoner. By 1947 most of the Waggoners were either dead or had moved from Fort Worth, but their name still commanded a great deal of power among the old-timers in the city, like Sid W. Richardson, who resided in a hotel called the Fort Worth Club and had his offices on the 24th floor of the Fort Worth National Bank Building at 714 Main. 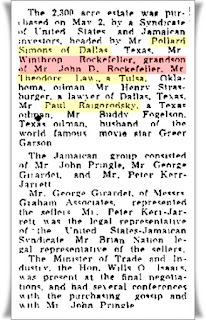 The Warren Commission testimony of Paul Raigorodsky disclosed that Gali Scherbatoff Clark (Max Clark's wife) was a cousin of Kyril Scherbatow, who lived in New York and Jamaica. 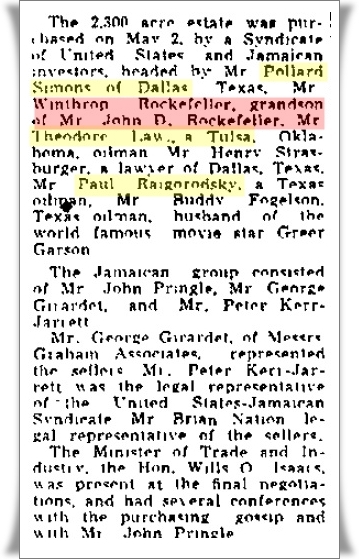 Thus, it seems the Clarks had invested with Raigorodsky in the Tryall Resort he had helped to build in Jamaica beginning in 1957. 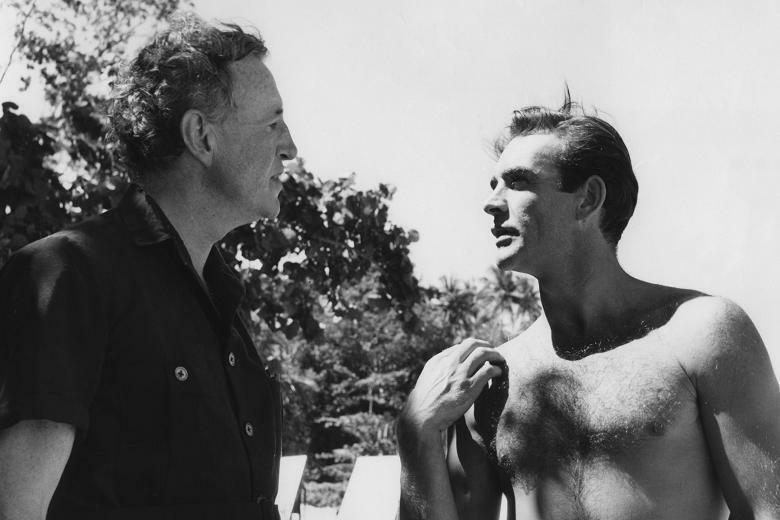 Intriguingly, the British novelist Ian Fleming also had a residence in Jamaica, as did the head of British Security Coordination (BSC), William Stephenson. Only in recent years has it been disclosed the extent to which BSC was using its agents to spy on the internal politics and policy of its American allies. The first research came to this blogger's knowledge from a fascinating book called The Irregulars: Roald Dahl and the British Spy Ring in Wartime Washington, written by Jennet Conant. A second, even more comprehensive report of the propaganda techniques used by the BSC appeared in Thomas E. Mahl's book, Desperate Deception: British Covert Operations in the United States, 1939-44. By the 1950s, a group of entrepreneurs--including John Connally, later governor of Texas, and Lloyd Bentsen, who would become a U.S. Senator--had purchased the land. In 1957, they founded the Tryall Club as a private villa resort. My God, they are going to kill us all! Stephenson had gone to live in Jamaica, where he had bought a property at Hillowton, overlooking Montego Bay - "the finest house in the island," he called it. 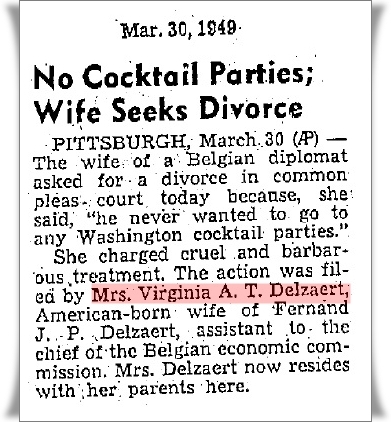 (Incidentally, it was his wife's choice). His example was followed by several of his friends, including Lord Beaverbrook, Sir William Wiseman, Noel Coward and Ian Fleming, all of whom acquired estates on Jamaica's beautiful north shore at this time. For a year or so he showed little interest in the outside world and was content to enjoy life on this island in the sun. Only gradually did he recover his interest in commerce and industry. With some of his war-time associates, such as financiers Sir Rex Benson and Sir Charles Hambro in London, General Donovan in Washington,and a number of Canadian and American industrialists like Edward Stettinius, former chairman of the U.S. Steel Corporation, he formed the British-American-Canadian Corporation, which developed into the World Commerce Corporation, originally designed to fill the void left by the break-up of the big German cartels which Stephenson himself had done much to destroy. Thus he and his colleagues on the board raised an initial $1,000,000 to help 'bridge over the breakdown in foreign exchange and provide the tools, machinery and "know how" to develop untapped resources in different parts of the world. The Hillowton tract was apparently owned in 1939 by Mrs. John King Reckford, who lived in New York City. Reckford published a notice in the Kingston Gleaner to have her 22 acre property registered after it was surveyed. Reckford was the former Virginia Aileen Thelfall of Crafton, Pennsylvania, who married Naval Lieutenant Reckford, scion of the American Lead Pencil Co., in 1936 in the church in Elberon, N.J. named for eminent banker Moses Taylor. After John's death in 1941, the property was sold to Sir William Stephenson, head of British Intelligence in the United States. Room 3603 states that Hillowton was owned by the BSC chief no later than 1943, when he invited Noel Coward to visit there. An aside to this story is intriguing as well. 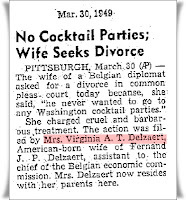 The seller of the Jamaican estate, Mrs. Reckford in 1945 married Fernand Jean Prosper Delzaert, a Belgian economist stationed in Washington, D.C., whom she divorced in 1949 (see news clip). MR. ROULD [sic] DAHL, writer, and friend of Sir William Stephenson, who arrived here yesterday afternoon by British South American Airways plane from London to spend a four week vacation. Mr. Dahl told the Gleaner yesterday that his first book "Flying Fast," was recently published, and the second, "The Satier," will be published in the United States next month. He will leave Kingston some time today for Hillowton Reading, where he will be a guest at Sir William Stephenson's winter home in St. James. ALL WRITERS MAY FORWARD their SCRIPTS to MISS LENA LEVY, STENOTYPIST. who has her office OPPOSITE the MONTEGO BAY POST OFFICE. PHONE 654. 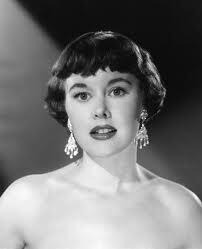 Some months ago Miss Levy got through 85.000 words for those well-known writers, the Max Murrays, and 40,000 words for that brilliant young writer, Ronald [sic] Dahl, who spent a few weeks with Sir William and Lady Stephenson at Hillowton. 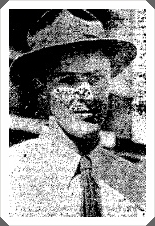 Dahl himself escaped for a month to Jamaica in early 1948, flying via Senegal and Brazil, and staying for two weeks with Hemingway at Sir William Stephenson’s house in Hillowton outside Montego Bay—a “dream place” where he went swimming every day on Max Beaverbrook’s private beach. 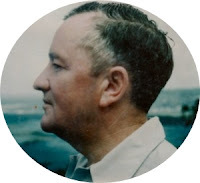 He then travelled east along the north coast of the island to spend a few days with Charles Marsh near Ocho Rios. But he ended up staying as the house guest of Pamela Berry, the Marchioness of Huntly, and making his Jamaican “headquarters” with her. Tryall sold to multi-million dollar group. We will pick up at this point, hopefully, in our next entry. 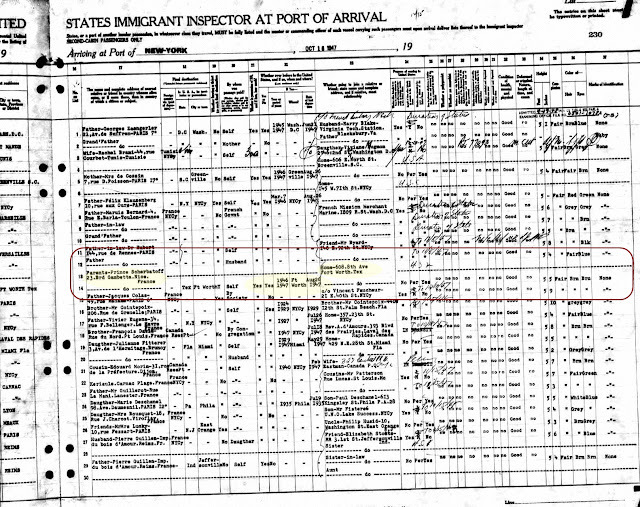 When George H. W. Bush went into business in Texas, the money was lined up for him by his Uncle Herbie Walker. Herbie learned investment banking from his father, Bert Walker. If we want to understand who pulled Bert's strings, which in turn controlled his grandson Poppy, we need to examine Bert's life in Long Island polo circles. That's where the billionaire class lived, and Bert was all about managing their money. It all began with the Dresser company. This site may contain copyrighted material the use of which has not been specifically authorized by the copyright owner. Users may make such material available in an effort to advance awareness and understanding of issues relating to the history of the global narcotics trade. We believe this constitutes a 'fair use' of any such copyrighted material. The material on this site is distributed without profit to those who have an interest in receiving the included information for research and educational purposes. If you are a legal copyright holder or a designated agent for such and you believe a post on this website falls outside the boundaries of "Fair Use" and legitimately infringes on yours or your clients copyright please contact the owner of this blog, Linda Minor. All posts by Linda J. Minor (all rights reserved) unless linked to another site.. Theme images by ozgurdonmaz. Powered by Blogger.